Stephen Strom spent his professional career as an astronomer. Born in 1942 in New York City, he graduated from Harvard College in 1962. In 1964 he received his Masters and Ph.D. in Astronomy from Harvard University. From 1964-68 he held appointments as Lecturer in Astronomy at Harvard and Astrophysicist at the Smithsonian Astrophysical Observatory. He then moved to the State University of New York at Stony Brook and served for four years as Coordinator of Astronomy and Astrophysics. In 1972 he accepted an appointment at the Kitt Peak National Observatory in Tucson, AZ, where he served as Chair of the Galactic and Extragalactic program. The following 15 years were spent at the University of Massachusetts in Amherst, MA; from 1984-1997 he served as Chairman of the Five College Astronomy Department. In 1998 Strom returned to Tucson as a member of the scientific staff at the National Optical Astronomy Observatory, where he carried out research directed at understanding the formation of stars and planetary systems and served as an Associate Director of the Observatory. He retired from NOAO in May 2007. Stephen began photographing in 1978. 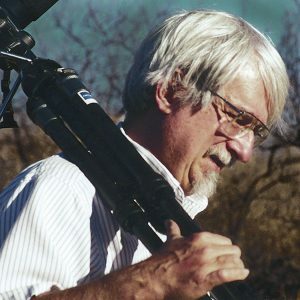 He studied both the history of photography and silver and non-silver photography in studio courses with Keith McElroy, Todd Walker and Harold Jones at the University of Arizona. His work, largely interpretations of landscapes, has been exhibited widely throughout the United States and is held in several permanent collections including the Center for Creative Photography in Tucson, the University of Oklahoma Art Museum, the Mead Museum in Amherst, MA, and the Boston Museum of Fine Arts. His photography complements poems and essays in three books published by the University of Arizona Press: Secrets from the Center of the World, a collaboration with Muscogee poet Joy Harjo; Sonoita Plain: Views of a Southwestern Grassland, a collaboration with ecologists Jane and Carl Bock; Tseyi (Deep in the Rock): Reflections on Canyon de Chelly, co-authored with Navajo poet Laura Tohe; as well as in Otero Mesa: America’s Wildest Grassland, with Gregory McNamee and Stephen Capra, University of New Mexico Press (2008). A monograph comprising 43 images, Earth Forms, was published in 2009 by Dewi Lewis Publishing. Sand Mirrors, a collaboration with Zen teacher and poet Richard Clarke, was published by Polytropos Press in 2012. A book comprising Strom’s terrestrial landscapes with images of the martian surface (Earth and Mars: A Reflection) was published by the University of Arizona Press in 2015. Death Valley: Painted Light with poet Alison Deming was published by George F. Thompson Press in 2016 and is distributed by the University of Arizona Press.